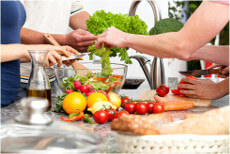 A study by researchers at Emory University suggests that Americans eat more than 30 percent of meals out of the house. And those cooked at home have a low percentage of fresh and whole foods when compared to the disproportionately high sales of processed foods that have diminished nutritional value. To help boost your health this year, strive to cook at home more often. From choosing your ingredients, to preparing and cooking for nutrient preservation, home cooking allows you to have complete control over what goes into your body. Cooking at home also allows you the ability to manage food allergies and sensitivities, as well as portion sizes. Furthermore, regularly preparing and eating healthy home cooked meals will help train your palate to enjoy healthier fare, while improving your creative cooking skills. Short on time? Try setting 1-2 days aside each week to do cooking for the week. Cook in large enough quantities that you can enjoy your home-cooked food as left-overs. On your cooking days, clean, prepare and package raw veggies like carrots, cucumbers, celery or chard for quick grab and go snacks. Remember to store food in glass whenever possible. If you are at a loss on how to start cooking at home, check out classes offered locally. If you are in a very small town, consider placing a classified ad for someone to teach you or check out any one of hundreds of online cooking websites and videos.